FLC’s 25 in 25 Campaign – we’ve made it! Foothills Land Conservancy reached a 2010 goal of protecting a total of 25,000 acres of East Tennessee land from residential and commercial development. It was a great way to kick off 2010 and celebrate FLC’s 25th birthday! 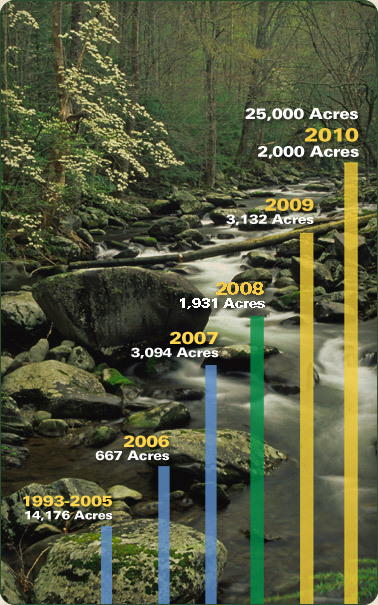 In 2009, FLC worked with 16 land owners to preserve 2510 acres! In addition, FLC partnered with the North American Land Trust to preserve an additional 1,898 acres of the Three Sisters property on Chilhowee Mountain – bringing us well over the acreage number needed to complete our goal. Click here to learn more about the 2009 Conservation Easements. Launched in 2007 – one of our best years ever – and one that saw more than 3500 acres protected, FLC set out to promote our mission of land conservation to Tennessee individuals and families. The primary method in which FLC works with land owners is to work with them on placing a ‘conservation easement’ on their property.